TRIFECTA was the first company to bring a comprehensive tuning product to market for your 6th generation Chevrolet Camaro, introducing its 2016 Chevrolet Camaro V6 (LGX) product in mid 2016. 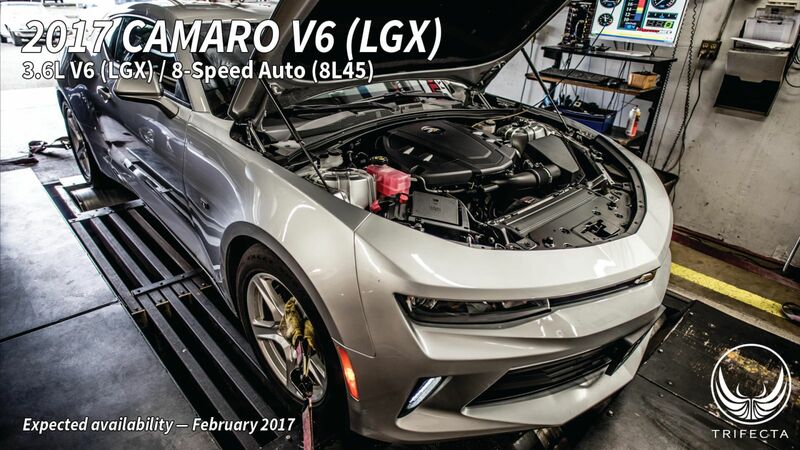 We're pleased to announce that we're wrapping up our 2017 Chevrolet Camaro V6 (LGX) product as well! There's been a lot of talk out there lately about the new T87A transmission control module (TCM) used in the 8 speed automatic transmission-equipped vehicles for 2017. Rigorous security protocols are requiring TCMs to be shipped somewhere and “unlocked” before they can be tuned. Defying the limitations others are subject to, we're also pleased to announce that we are able to offer transmission flashing without having to remove the module from the vehicle and “unlock” it! View this product in our store!